Tag Archive | "Buenos Aires Tetra"
The Buenos Aires Tetra (Hemigrammus caudovittatus) is an active, slender, silver bodied tetra that makes a great addition to any soft water South American community tank. Buenos Aires Tetras have a clear body with a thin blue line through it from the gills to their caudal fin. The caudal and lower fins have an orange tint and there is a dark area at the base of the caudal fin. As with most fish, spawning enhances the coloring of the fish. 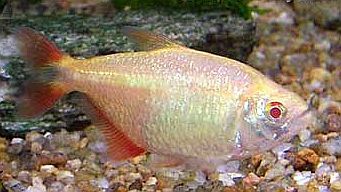 There is also an albino species of Buenos Aires Tetra that is commonly found in aquarium shops. 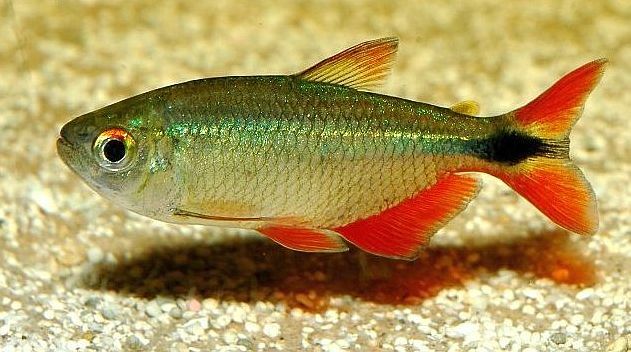 The Buenos Aires Tetra originate from the Parana and Uruguay River Basins of Buenos Aires, Argentina which is where their name is derived from. They are a hardy schooling fish that thrive in groups of six or more individuals of the same species. They are mildly agressive and often classified as “fin nippers” therefore they should be kept with other aggressive tetras such as the Silver Tip, Serpae Tetra, Blind Cave Tetra or Colombian Tetra. Except for the Java Fern , the Buenos Aires Tetra will eagerly feast on most live plants, which is why artificial plants are frequently used in the aquariuim to replicate their natural environment. Placing rocks and driftwood into their tank will provide them with places to hide and make their natural habitat more realistic looking. Buenos Aires Tetras will occasionally breed in an aquarium setting if they are placed in a separate tank with some bushy plants. Successful tropical fish keeping enthusiasts recommend lowering the water level in the breeding tank and providing the pair with slightly acidic water conditions. Eggs will be scattered on the plants at which time the parents should be removed from the tank. Eggs will hatch in a couple of days and when the fry will be free swimming within a week. Provide them with newly hatched brine shrimp and finely ground flake food untill they are ready to accept regular fare. Buenos Aires Tetras are omnivorous and in addition to flake foods will accept a variety of small foods such as brine shrimp, daphnia , bloodworms , tubifex , and micro pellets. Buenos Aires Tetras are usually available for purchase when they reach 3/4″ to 1-1/4″ in length.